Not to be confused with Goodale State Park. 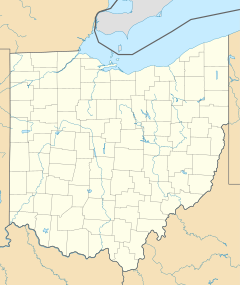 Goodale Park is a public park in the Victorian Village area of Columbus, Ohio. It was donated to the city in 1851 by Lincoln Goodale. For a few months during the Civil War, it was a staging area for Union troops known as Camp Jackson. ComFest, a large, free, non-corporate, music and arts annual festival, is held in the park in June. Located immediately north of downtown Columbus, the park is bordered by Goodale Street on the South, Park Street on the East, Buttles Avenue on the North, and Dennison Avenue on the West. The Governor's Guards, a corps of soldiers stationed at the camp, marched through Columbus on a Saturday morning to urge the local people to show their patriotism and enlist in the cause. A Captain Morrow was so successful that his company grew so large with new recruits that he had to start a second company of troops and that one was nearly full. "Any young man interested in enlisting in this company, "B" of the 3rd Regiment, is told to call at Camp Jackson at an early hour." In June, Camp Jackson's military operations are transferred to Camp Chase, 4 miles (6.4 km) west of Columbus, and Camp Jackson reverts to being a public park. During its peak, about 8000 troops were stationed at the camp. Among the officers stationed at the camp were two future presidents: Rutherford B. Hayes and William McKinley. ^ "Facility: Goodale Park". Columbus Recreation & Parks Department. Retrieved February 22, 2012. ^ "Goodale Park". Geographic Names Information System. United States Geological Survey. Retrieved February 22, 2012. ^ a b Mullet Randall, Beverly (March 2007). "Dr. Lincoln Goodale and His Living Legacy Part Four: Goodale Park: A Brief History from the Beginning through the Civil War Years". Short North Gazette, Columbus, Ohio. Retrieved June 19, 2012. This page was last edited on 23 October 2018, at 14:03 (UTC).